Well, we really have a mystery object for February! 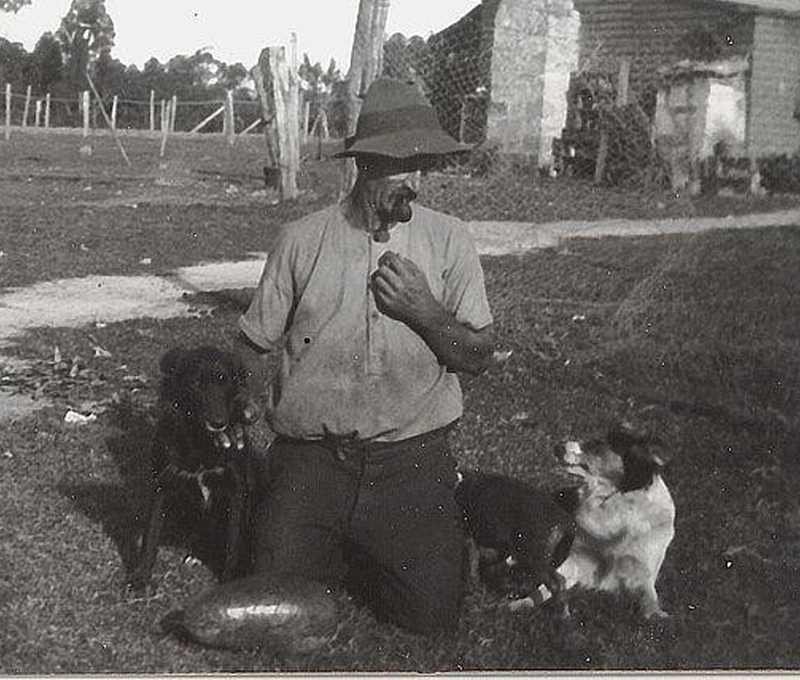 I can’t make up my mind whether it is animal or vegetable… Is it part of the intestines of an animal that Ambrose Hatfield has slaughtered to feed his family? Perhaps it is a haggis – some part of an animal stuffed with mince meat, bread and so on by this resourceful father or his wife! Several people I’ve spoken to are of the same opinion as me on that one! They claim to have even seen the tie off at the end, as in a sausage, that keeps the filling in. A close up - do you know what it is? On the other hand I have agreed with conversations that are more in favour of a large watermelon or prize gourd on display for the camera… I’m undecided. We’d love for you to take a look at the blown up images, and please leave us a comment to let us know what you think! 1. I have had dogs in the past, and if that was some sort of meat, I think the dogs would be far more interested in it. One of the dogs has turned tail and is leaving, while the one which is being ‘restrained’ looks more like it is being scratched under the chin to me. If I were restraining a dog I would be holding the scruff of its neck. Of course, they might be the best trained dogs in history . . .
2. If it was meat for eating, I think it unlikely that it would be put on the ground in the dirt, let alone in front of the dogs. The picture would be more likely to be posed at a table or at least on a cloth. 3. I would assume that a homemade sausage might be less perfectly shaped. 4. 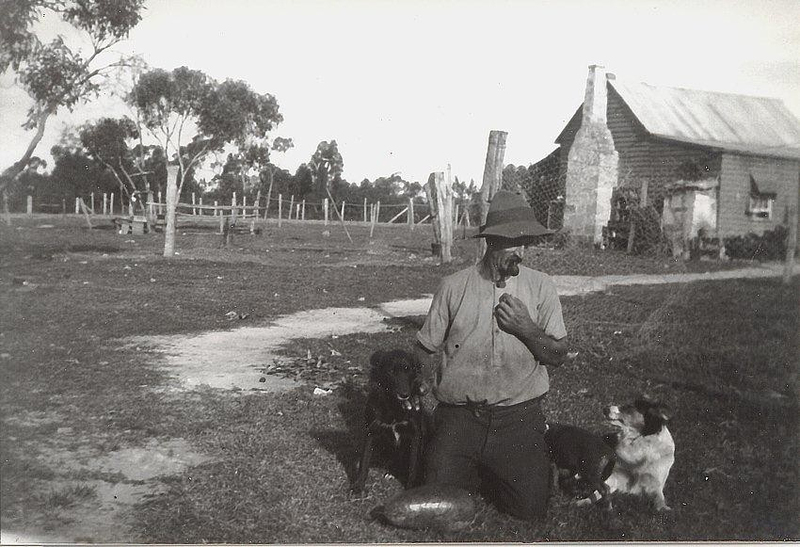 I seem to recall that the most common animals kept and slaughtered by people in Berowra were poultry and pigs. I don’t know a lot about animals, but it seems that the organ is very large to have come from either a bird or a pig. Of course, I could be wrong, or it might come from a larger animal like a cow. 5. 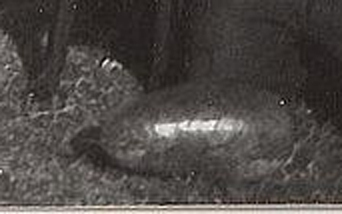 The ‘tie off’ which people have seen could be a piece of vine or stem from a marrow or a melon and there is a shadow which could be a leaf at the bottom right hand side of the ‘mystery object’. 6. Photos were not nearly as common in the days when this photo was taken and I am doubtful that a photo would be taken simply of meat for dinner or of an animal organ which would have been reasonably common. A prize winning vegetable, or one which was unusually large however might be the kind of thing which would attract a photo! I have to say Elissa has offered some rather good points to support her argument that this mystery object is probably vegetable. However I still think it could be of animal origin such as an internal organ mainly because of what appear to be visible blood vessels on the item’s surface….or are they? Maybe photographed because it was a little out of the ordinary!? Animal, vegetable – or mineral? Is this a large, figured glazed stone? Large opal? That would merit its being on display, and also explain the indifference shown by the dogs. Animals and vegetables are trough-fodder. Opals are not. Indeed, mineral is a possibility, and certainly if I found a precious stone that large I would feel the need to display it too!